This past week, as part of the Knight-Mozilla Ideas Challenge learning lab, we heard from presenters Mohamed Nanabhay, the Head of Online at Al Jazeera English and Shazna Nessa, the Director of Interactive at the Associated Press. 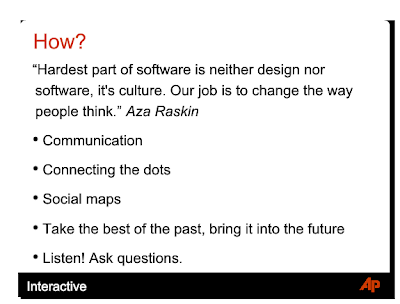 "the hardest part about software is neither design nor software, it's culture." "not everyone is going to be great at everything and to know what people are good at and what they're not." As my Public Radio Roadtrip project has the potential to elicit collaboration between different members of a news organization, each with differing skill sets, I have been thinking about how to best approach this issue. "much of the most popular content was raw video with natural sound"
I was also inspired to discover that Al Jazeera English been offering their coverage with a Creative Commons license on YouTube at http://cc.aljazeera.net/ and on flickr. Nanabhay stressed that he was amazed by the many ways in which their content has been used beyond newscasts and documentaries such as within video games or in public service announcements. And it could be said that when you publish your media elements unbundled to the world that you could also be serving your own newsroom as well. What this idea drives home is the idea that different people with different strengths can be enabled to collaborate on a single project using disparate online resources. For instance, a photographer could put their photographs on flickr while a reporter could write and produce their finished piece as audio and upload this to SoundCloud. All this, while the data visualization expert could compile these disparate resources within the finished app. The idea that not all content needs to go through one tool to find its way to the web is subtle and empowering at the same time. And this is one thing that has been baked into the Public Radio Roadtrip, that media elements can come together from virtually anywhere on the web. One additional way where the Public Radio Roadtrip enables news staff (or even citizens) to easily use this tool, is that a finished roadtrip can be published anywhere using only a simple embed (as emphasized by presenter Burt Herman's experience with Storify). learn how to talk tech to non-tech people. Don't assume people don't know anything. They may not know how to talk [in technical terms].